 Pia & Michio was launched by creative maker of things, Kristi Yamanaka in Honolulu, Hawaii in 2012. From as early as age four, Kristi would spend summers on the Big Island of Hawaii with her aunty and uncle who are both well-known and respected local artists. Here, she would spend weeks experimenting with various types of art mediums: paint, collages, jewelry design, clay building, card design + collage layout, with constant collaboration with her artist aunty. A passion for jewelry design emerged from an early age of thirteen. Kristi moved to Orange County, California where she began a career in fashion with Ralph Lauren, Louis Vuitton, and Hermes while earning a Bachelor's in Communication from California State University at Fullerton. She returned to her home town of Honolulu in 2010 to spend time with the grandparents who helped raise her. It is with a combination of these past experiences, how Pia & Michio was born. In early 2016, Kristi fell in love with the ancient Japanese art of Shibori. Pia & Michio offers an assortment of Shibori lifestyle accessories as well as unique jewelry pieces that are easy to add to any collection. The island lifestyle has much inspiration to offer, along with a high quality of life. She can be found paddleboarding or hiking around the island with her best friend, an English Golden Retriever, named Haupia (Pia for short). Pia & Michio was founded from Kristi’s appreciation and heart for Pia & late grandfather, Michio.